I have come to the conclusion that the trick to living a good and purposeful life is to figure out how to keep your head screwed on straight in the middle of adversity and challenges. When you do lose your clarity, I feel it is important to know how to re-screw your head back onto your shoulders. I have repeatedly talked about how I use drawing and the ICWIB! activities to move myself out of reaction and into my problem-solving mind or re-screwing my head back onto my shoulders. Today I would like to share with you the above poem that I have taped to my refrigerator because it perpetually reminds me how and why I need to re-screw my head back on. 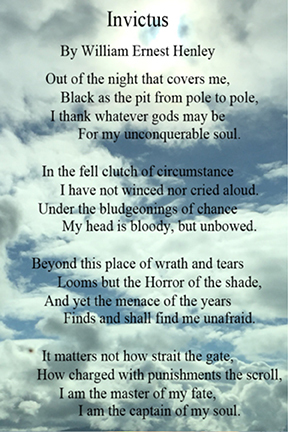 William Ernest Henley wrote this powerful poem when he was recovering from tubercular infection—a very challenging, often life-threatening situation. However, I feel it also speaks to, and applies to, any test of faith. In times of darkness and confusion the words to this powerful poem, especially the last stanza have the ability to recalibrate my internal GPS and set me back on course. With this in mind, I invite you to tape the poem to your refrigerator as well. I also invite you to explore some of the ICWIB! art activities and videos for FREE because they are a wonderful way recalibrate your internal GPS so you can continue to live a good and purposeful life.